When I see kids learning to drive these days in compact cars with automatic transmissions, I wonder where’s the challenge? Back in my day, (beware when a gray-haired woman begins a sentence this way), we didn’t have medicated driving instructors and signs on the car warning others that there was a student driver (hysteric child) behind the wheel. I learned to drive on the Washington state beach, in a big American car with a manual transmission and my father yelling profanity. He didn’t give me any pointers, just lots of criticism. And remember how the clutch had that death-defying ability to create a multi-whiplash experience before you even got 5 mph? A little like a carnival ride actually. My father was not the sort to go on a carnival ride. The driving lesson came to an abrupt halt when I hit a whale carcass. Yes, it was very visible. In my defense, my father wanted to see what it was and from a distance it was hard to identify. And I didn’t hit it hard, just bumped it really. I was almost stopped. The carcass did smell pretty ripe and some of it got hung up on the bumper. I walked back to where we were staying. A lesser hormonal-teenage-girl would have burst into tears and settled for the family station wagon, but not me. I was born for cross-country trips in a Volkswagen bug, I had to master the shift. A year later, my boyfriend tried to teach me; he didn’t yell profanity, he was the tense silent type. In the end, I borrowed my boyfriend’s car at 3 am one morning, and splatted and jolted my way to the mall. After three hours of touring the lot and without the external male distraction, I learned to shift smoothly, lightly, powerfully. And back in reverse. This is how the Urban Dictionary describes Clutch: the crucial moment that comes between winning and losing (Derived from the clutch mechanism in a manual car, where perfect timing can mean the difference between a launch and a stall). Is this a great analogy for riding, or what? The ART is in the transition, that ease of shifting between gaits is where partnership exists; jerky and unbalanced or smooth and powerful. We all know a bad transition when we see one: A jarring loss of balance, a human with jerky hands, tight legs and a bouncing seat, cuing a horse have a tense poll, hollow neck and back, and irregular strides. Usually because the cue is too big, too quick or too harsh. In other words, you and your horse are in the car with me and my father and you don’t want to be there either. Disclaimer: Riding, being a physical interactive conversation with another sentient being who weights a thousand pounds, is hard to learn from the written page. There are no shortage of techniques described but since we don’t all use words the same way, it’s virtually impossible to tell if you have it right without a ground person. I’m going to describe how it could feel in hopes of inspiring better technique. Did that make sense? Upward transitions begin with an inhale, the lungs expand and we are a bit lighter in the saddle. 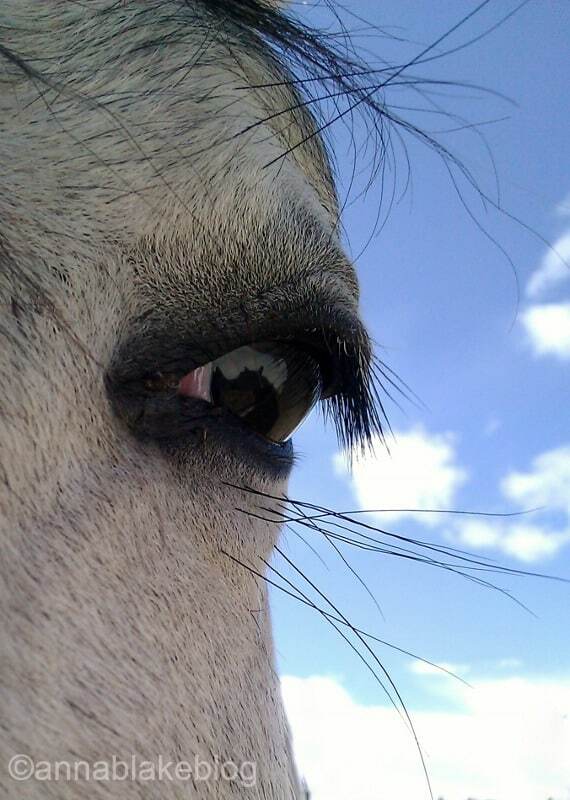 There is energy in our core and the horse begins to respond. Apply both calves, inhale again, give a verbal command if you like, and then give the horse time to respond. If you get even a small response, reward him and ask for more. Slow and steady, the jet builds speed until it leaves the ground and flies. Note: if you go to the whip before he has time to answer, he will shut down. If you nag every stride with your legs he will be dull to the constant assault. You think he’s lazy and needs spurs, but your cues are so hidden in trash and he can’t find them. Stay with your horse, let the rhythm build stride by stride. You maintain neutral balance and stay out of his way, so he can do the same. Forward, the joyous call to partnership, Forward! Note: The rider isn’t the one who trots or canters. We just give the cue and the horse does the work. It seems obvious in print, but all of us have seen people who over-ride their horse off his feet and out of balance. Downward transitions begin with an exhale and we are a bit softer in the saddle. Like a jet landing, shoulders stay back for balance and there is a gradual stride by stride slowing. Half-halt as much as you need, reward him for the tiniest response so he knows he got it right and he is confident to try harder, and then cue the new gait. Melt softly into the saddle, don’t collapse and wreck. Relax and exhale again. Core tension is not the same thing as core strength. Stay inside of each stride, connected with your seat. If you are cuing his body to decelerate, use your body to cue it. It’s not a job for your hands; pulling the bit (Metal on Bone) creates tension and resistance. In riding a dressage test, we score each transition. When does it begin? In the first box of Training Level, Test 1, the directives include Balanced Transition. Scoring transitions continues through Grand Prix. I love how these tests are designed. If you ride them correctly, whether you compete or not, the result is a strong, supple and responsive horse. Because we don’t ride this way to please the judge, we do it for the good of the horse. Yay, Dressage! Love the anology between the VW and horse… I still drive a standard, and as with riding some transistions are better than others… I know… breathe! Heheheh!!! I am sure I never took a breath that day on the beach! It’s so difficult to use the stick shift/collection anology when your students can’t drive standard. And this happened waaaay back when…ummm, seventies? Lately I’ve tried to explain the best use of the leash for a dog is light contact, same as with a horse. Again, blank stares. I just don’t speak the right language! I was working for a QH trainer as a high schooler and one day he told me to go pick up an auger in his truck, which was a manual. I said, “But I don’t know how to shift!” and his answer was, “Well, I guess you will learn. Go pick up the auger.” I got stuck on a hill at a major intersection during rush hour, stalling out over and over as the light kept changing and people piled up behind me honking and swearing. After what seemed like hours but was probably a few minutes, I managed to get into gear and go forward up the hill and through the light. Never had a problem after that moment-a right of passage for horse girls! Tossed into the deep end of the horsegirl pool!! Thanks. This was the perfect analogy for me, thank you, Anna. I understand the need to find the right timing and feel between clutch and gas, and how every truck has a different set point of perfect balance. Same with riding. What I have never heard is inhale on upward, exhale on downward. I like it. No idea if I do that? But sure going to watch and try for it!